Edakkal cave is a fascinating place of Neolithic rock inscriptions. It definitely worth a visit if you have Wayanad travel plans. Thick forests or remoteness could not obscure an ancient civilization that happened there thousands years ago. Today people climb a kilometer uphill to look and admire what those ancient people engraved on the black walls of the cold chamber. 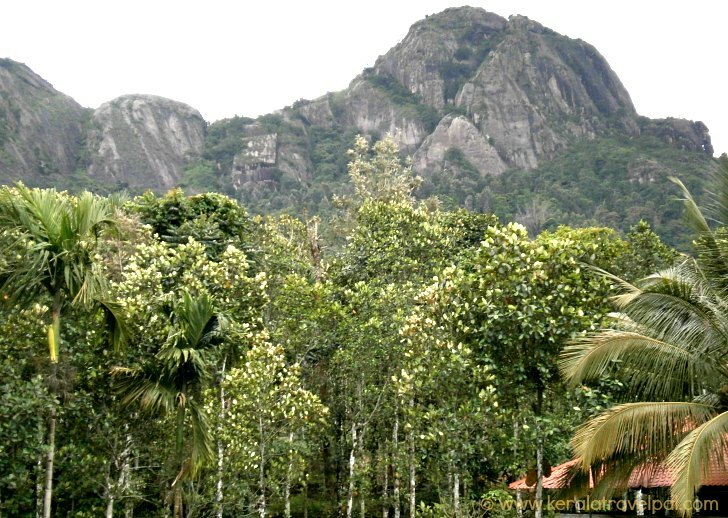 Three kilometers from Ambalavayal in Wayanad, Ambukuthy Mountain stands tall and proud holding two caves at its top, one above the other. Rock engravings are on the upper cave walls. You may have heard that Edakkal caves are not caves. Then what are they? It is true that these caves are not holes in the mountain. The giant rocks of the top split forming chamber like enclosures, one above the other. 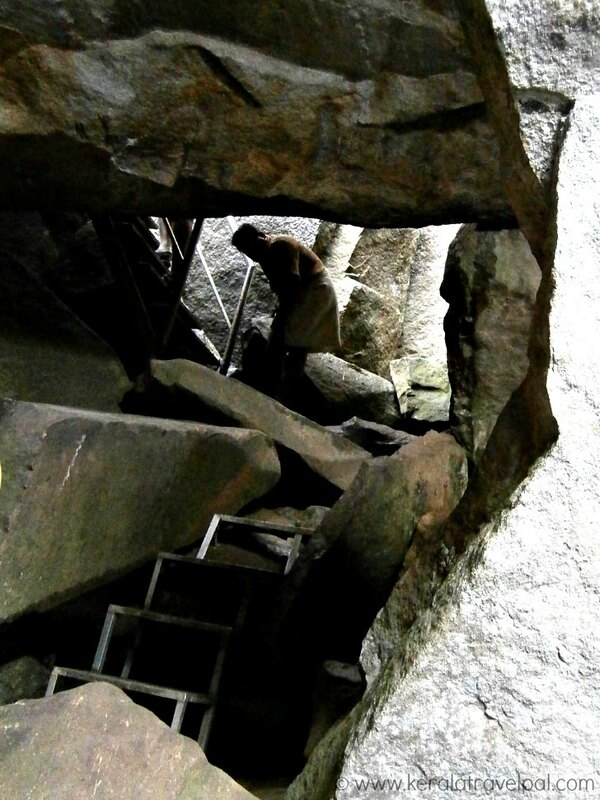 A gigantic rock somehow got stuck at the top, forming a natural roof to the upper chamber. This is a whale of a rock and the way it is held at the top is quite surprising. That is why the place came to be called Edakkal, which in local dialect means stone in between. Earthquake is the easiest and most reasonable explanation one can come up with, to explain such a weird formation. In case you are curious, the upper chamber is of 29 meters (96 ft) length, 6.7 meters (22 ft) width and 9.1 meters (30 ft) height. The lower chamber is much smaller. Nevertheless, it has the critical role of sustaining the whole structure. The caves are not caving in just because the lower cave as a base is sufficiently supportive. It does not discount the fact that the cave system is quite fragile and can only hold only a certain amount of weight. Staff here is quite mindful of this. They let only small groups of people at one time to visit the cave.The entrance as well as another cleft at the far side brings light inside the cave. Climbing 1 kilometer up the hill is a struggle. Be prepared to be exhausted. Fred Fawcet the police superintendent of Malabar state on a hunting trip happened to come across a Neolithic Celt. He got curious and explored the region further. That led him to the top of the mountain where he found the caves. Greatly impressed by what he saw, Fawcet wrote about it in archaeological journal. He informed the world about it. 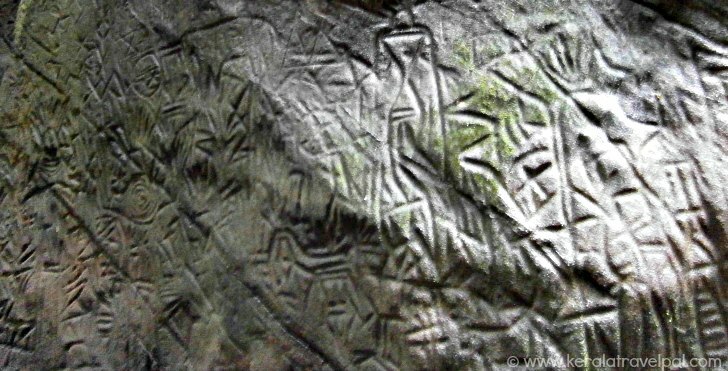 Prehistoric stone paintings have been found in many places. Stone carvings similar to that of Edakkal cave are rarely found. Engravings extend over 500 sq ft of two walls, reaching up to a height of 4 meters. They belong to different ages. The cave was occupied during several periods. Interestingly, the latter occupants did not tamper with the earlier engravings. Possibly they were considered sacred or were held there with fear. Archaeologists consider that the earlier incisions were made between 3000 to 6000 years ago during the Neolithic age. They are linear pictorial engravings. Shapes drawn in close proximity include human figures, animal figures, squares, circles and so on. The writings on the eastern wall are considered to be of a later era. Inscriptions in Sanskrit in Northern Brahmi characters are considered to be of between 2nd and 5th centuries. Out of five inscriptions, two have been so far deciphered. Other similar engravings such as Ghatsila in Chotanagpur and Styria in Alps pale in comparison to the richness and style of Edakkal cave engravings. Some historians see a similarity of the figures to that of the ancient North Indian civilisation of Harappa and suspect some sort of connection. Edakkal cave engravings shed a new light to the ancient civilisation of the region thus forcing historians to rethink about the history of Wayanad and even broader Kerala. For those who prefer to get lost in this remote corner of ancient heritage and unspoiled beauty, Edakkal hermitage is stay choice right at the bottom of the hill. Overlooking the walkway it is located just near the ticketing office. For those who visit Edakkal along with the other attractions of Wayanad, preferred place of stay may by Kalpetta or Batheri. Edakkal is 12 kilometers from Sulthan Batheri town. Access from Batheri is easy as Edakkal is not too far from the main road. The hard part is the 1 Km trek to the top of the mountain. The best strategy is to take it slow than to rush fast and burn out before reaching the top. Nearest towns : Ambalavayal at 3 kms, Sulthan Batheri at 12 Kms and Kalpetta at 32 kms. Railway Station : No rail access to Wayand District. Nearest Railway Station is Kozhikode at around 100 Kms . Food Options : No eateries at Edakkal. Restaurants at Sulthan Batheri (12 Kms). Accommodation Options : Edakkal hermitage right at Edakkal. Lodges and hotels at Sulthan Batheri town. More choice at Kalpetta, the largest town in Wayanad. Best time to visit : Can be visited throughout the year. Beware of slippery conditions during peak monsoons.Visiting hours : Entry is only till 5:00 PM. Nearby Attractions : Chembra peak, Soochippara falls, Meenmutty waterfall, Kanthanpara waterfall, Kalpetta town (shopping & food), Muthanga Sanctuary, Kuruva Islands, Banasura Sagar Dam and Thirunelli.